These 10" x 13 1/2" oversize static sheets cover the back of a standard 8 1/2: x 11" buyers guide so it can adhere to the side window glass on all 4 sides. No residue upon removal. Just position the form on the static cling material and press it against the side window around all edges. 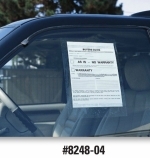 Static cling window form holders are packaged 100 per box.